This framed canvas was personally autographed by Detroit superstar, and humanitarian, Ted Lindsay. Ted Lindsay spent 17 years in the NHL, winning 4 Stanley Cups, NHL 1st Team All Star 8 teams, and earned the Art Ross Trophy once. Ted Lindsay was inducted into the Hockey Hall of Fame in 1966, inducted into the Canada's Sports Hall of Fame in 2002, inducted into the Ontario Sports Hall of Fame in 2009. Ted Lindsay's #7 was retired by Detroit on November 10th, 1991. 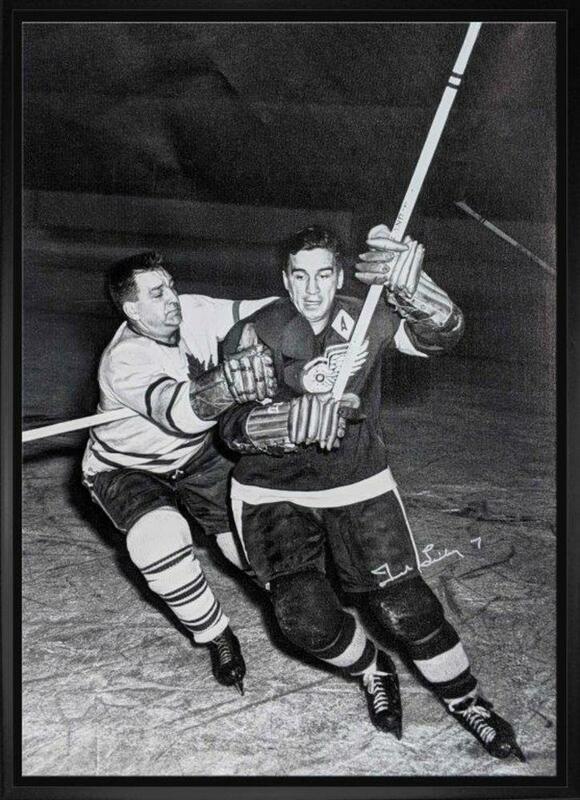 This canvas shows the strength and agility of Ted Lindsay, and his capability out strengthen any competitor. The image has been printed on to high quality art canvas and is professionally stretched and mounted on the back of a 3/4" deep wooden frame. A Frameworth hologram and certificate of authenticity are included to ensure the legitimacy of the signature. Frameworth is an official licensee of the NHL & NHLPA. Frame Size: 22x31".